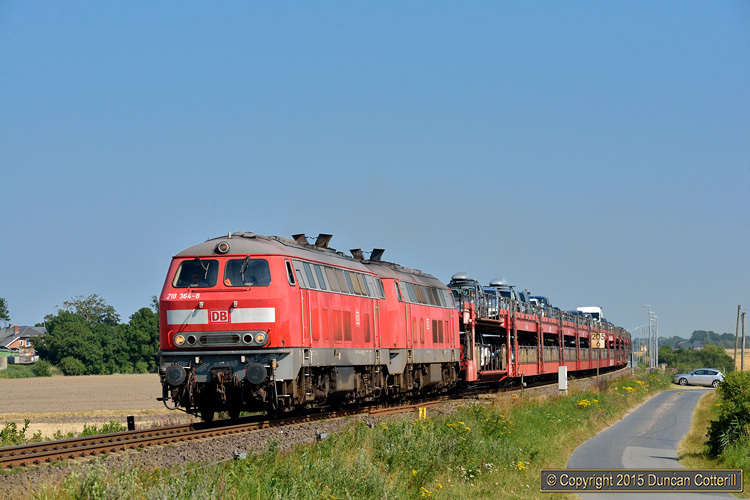 218.364 and 218.311 passed Lehnshallig with the 16:16 Niebüll to Westerland SyltShuttle on 19 July 2014. The SyltShuttle car-carrier service provides the most convenient way for motorists to travel from the mainland to the island of Sylt. Drivers and passengers travel in their vehicles and the view from the front car on the top deck must be superb, provided you don't get asphyxiated by the exhaust of a pair of 218s.